Rob Dyson talks with the Road Racers Podcast. 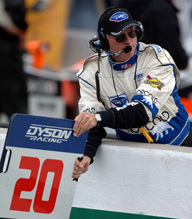 A Road Racing Veteran – Rob Dyson and Dyson Racing have been involved in Road Racing for many years. He started his Auto Racing career in 1974 driving a Datsun 510. In talking with Rob we found some interesting things about his racing past. Rob is the first person that we have deployed our new “Quick Questions” format with – and we think he liked it !